Existing home sales continued to increase from the winter quarter and passed the 5 million mark for the first time since October 2013. This increase is positive news for future new home sales because each prospective repeat buyer must sell their existing home before buying a newly built home. Existing home sales increased 2.6% in June, but are still 2.3% below the same period a year ago. The National Association of Realtors (NAR) reported June 2014 total existing home sales at a seasonally adjusted rate of 5.04 million units combined for single-family homes, townhomes, condominiums and co-ops, up from an upwardly revised 4.91 million units in May. All four regions increased from the previous month, ranging from a 6.2% increase in the Midwest to 0.5% in the South. The South increased 1.0% from the same period a year ago, while the other three regions decreased, ranging from a 2.4% decrease in the Midwest down to a 7.3% decrease in the West. Seasonally adjusted condominium and co-op sales increased 3.4% in June, and were up 1.7% from the same period a year ago. Although the first-time buyer share increased to 28% in June from 27% the previous month, this share continues to lag far behind the historical average first-time buyer share of about 40%. Tight lending conditions continue to buffet first-time buyers despite reports of easing standards, and a full recovery awaits their return. 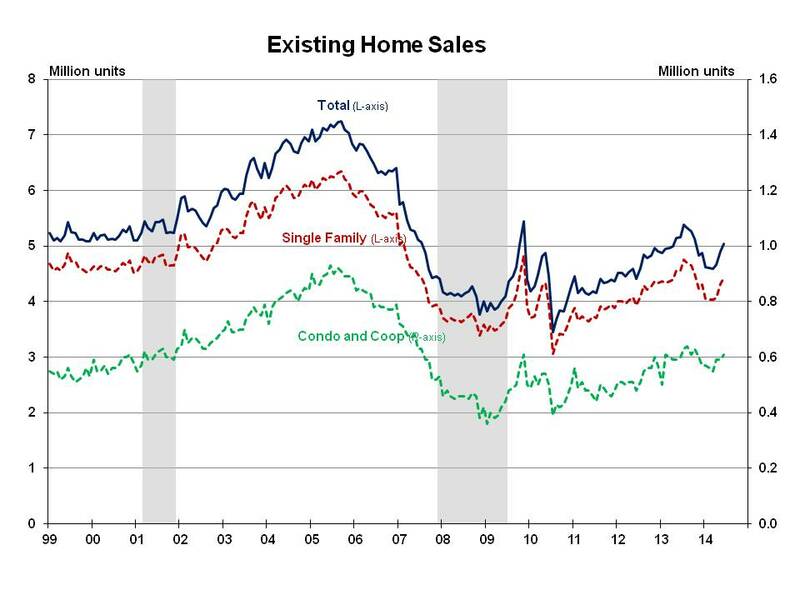 Total housing inventory increased 2.2% in June to 2.30 million existing homes. At the current sales rate, the June 2014 inventory represents a 5.5-month supply, unchanged from May but 6.5% higher than the same period a year ago. NAR also reported that the June median time on market for all homes was 44 days, down from 47 days in May, but up from 37 days during the same month a year ago. NAR reported that 42% of homes sold in June were on the market less than a month, up from 41% in May. There were more signs that the market is being embraced by home buyers. The share of distressed sales remained unchanged in June at 11% compared to a much higher 15% in June 2013. Distressed sales are defined as foreclosures and short sales sold at deep discounts. All cash sales remained at 32% of transactions for the third straight month, up from 31% during the same period a year ago. Individual investors purchased a 16% share in June, unchanged from May and down from 17% in June 2013. Some 69% of June investors paid cash, up from 68% last month, but still below the 71% level in April. The June median sales price for existing homes of all types jumped again for the fifth straight month to $223,300 from a downwardly revised $212,000 in May, and is up 4.3% from June 2013. The median condominium/co-op price increased for the fourth straight month to $ 215,700 from $212,300 in May, up 3.2% from June 2013. The Pending Home Sales Index increased 6.1% in May after increases in March and April. Therefore, June existing home sales were expected to continue the increasing pattern from the very slow start at the beginning of the year. Higher existing home prices are making homes less appealing for investors. The increased inventory of existing homes coupled with increased builder confidence will expand choices for first-time buyers, the missing link in this housing recovery. The June new home sales numbers will be released Thursday. While crossing the 5 million threshold is good news, sales continue to lag in the true test of progress, the year-over-year numbers. The problem with sales should be obvious to all reading this post. It is the disappearance of 30% of the first-time buyers who would participate in a “normal market”. If the first-time buyer problem is fixed, the real estate market would be fixed and the nation’s economy would be showing positive growth. Why the industry associations, NAHB, NAR and MBA continue to ignore the core problem and continue to paint smiley faces in their reports is beyond my comprehension. To attribute the serious decline to “tighter lending standards” may sound credible but FHA standards are not that much tighter. It would behoove the industry associations to organize and fund a quick survey of potential first-time buyers to determine what exactly is keeping them out of the market so the real reason can be addressed. My guess is that far too many potential first-time buyers are under the mistaken impression they need a large sum of money and near perfect credit to buy a first home. If we continue to do nothing, we will never know.